The Middle East is a confusing place. 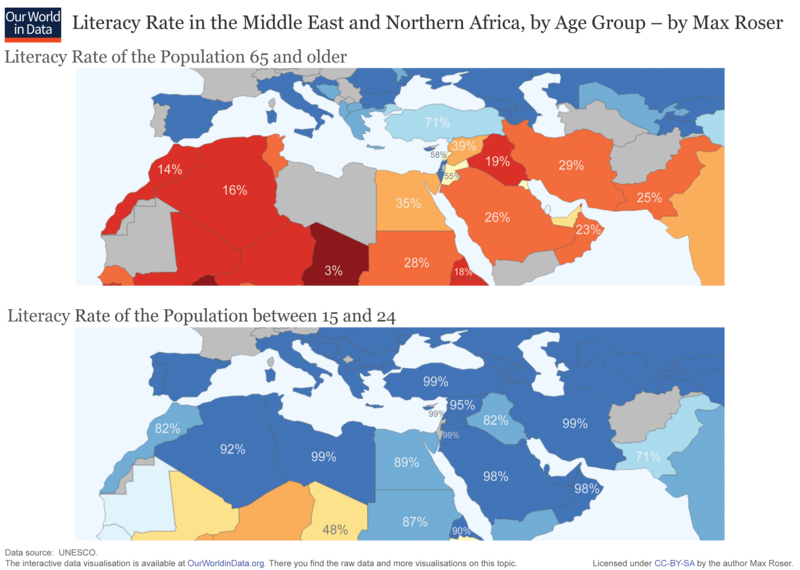 While the seven maps below don’t provide an exhaustive list of the facts, figures, rivalries, or conflicts in the Middle East, they do give some insight into the trends and forces that drive them. 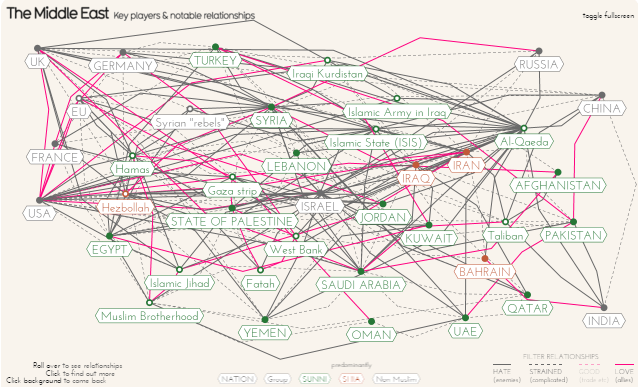 And hopefully, they are helpful in making sense of the region. This map shows regional literacy rates for two different age groups: ages 14 to 24 and ages 65 and up. It’s striking to consider that from one generation to the other, literacy rates have gone from levels similar to those of 17th century Europe to nearly on a par with Europe in the present day. The map is from Oxford Economist Max Roser‘s Our World in Data, a collection of data-driven graphics guaranteed to leave you optimistic about the state of the world. In majority Muslim countries, does a “huge majority support Islamic State?” Or is ISIS “nearly universally hated?” There is no shortage of unscientific / unrepresentative reports around the web to support nearly any opinion on this topic. But the scientific research addressing this question has been very consistent. Sourced from 6 research organizations, this map displays the percentage of the population that supports ISIS in 20 majority Muslim countries. As a whole, these countries are home to more than half of the world’s Muslims, and the overall rate of support for ISIS comes out to about 7%. Since posting this map last week, I’ve received responses from many people, some who see these figures as high and others who view them as low. I see some validity to both perspectives, but there is no disputing that 7% is far lower than U.S. perceptions. 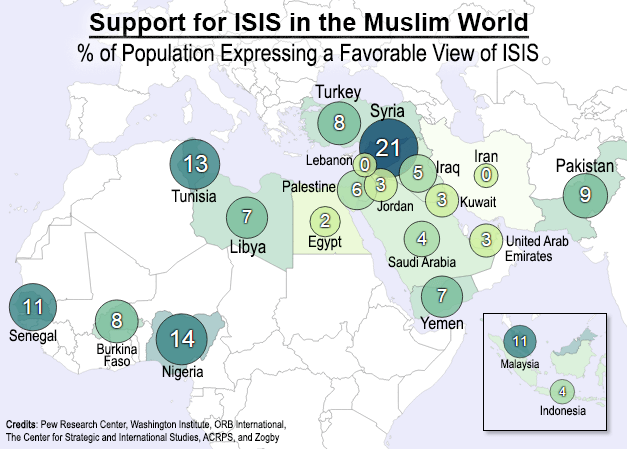 Most Americans believe at least half of the world’s Muslims support ISIS. The combined territory of Israel and Palestine measures only about 8,000 square miles, roughly the size of New Jersey. Yet, the fight over how the land should be divided is a divisive conflict involving nearly the entire world. The U.S. favors Israel, whereas most majority Muslim countries favor Palestine. That much you probably know. But you may not be familiar with how the rest of the world breaks down. This map* shows the countries that recognize Israel only, those that recognize Palestine only, and those that recognize both. There is also an interactive version of the map if you’d like to take a closer look. It’s incredible that a civil war in a relatively small, far away country can impact world politics in so many ways. 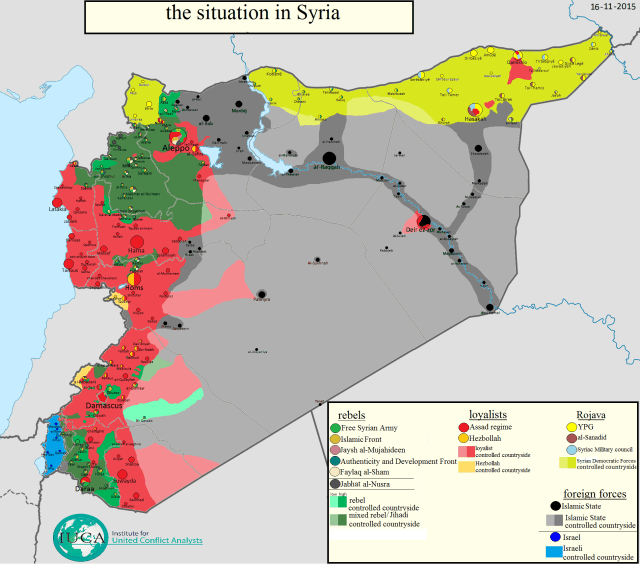 The rise of ISIS, U.S.-Russia relations, nuclear tensions with Iran, and the refugee crisis are just a few of the issues intertwined with the four-way conflict in Syria. Several news websites have published maps explaining the war, but the most comprehensive one doesn’t come from the BBC or the New York Times. It was made by Thomas van Linge, a 19-year-old cartographer from Amsterdam. Van Linge posts updates on a regular basis. Check here for the latest version. Much of the Middle East’s current geopolitical order can be traced back to a crude map drawn by two men as part of a secret agreement in 1916. 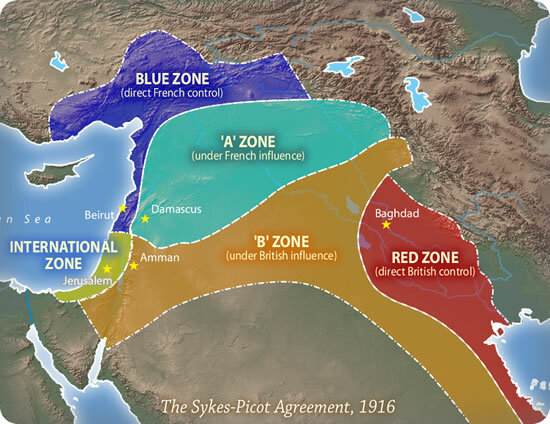 Sir Mark Sykes (English) and François Georges-Picot (French) carved up the former Ottoman Empire into zones of influence for their respective countries. 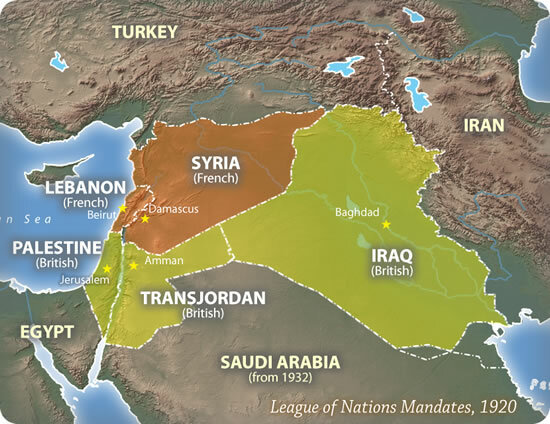 These zones later formed the basis for many of the national borders, and ethnic / sectarian tensions, that persist in the Middle East today. Maps via Geoffrey / NPR. 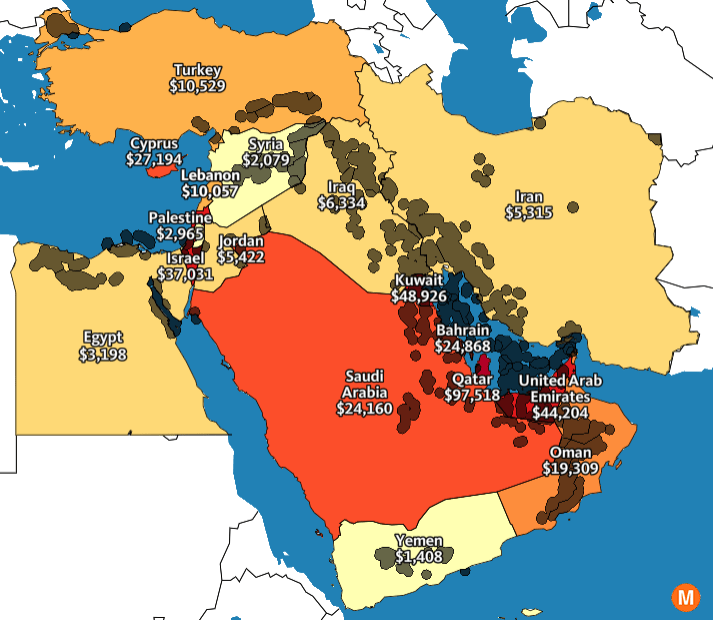 The Middle East produces about a third of the world’s oil*, but the reserves are not distributed uniformly. As this map shows, the oil deposits are heavily concentrated in and around the Persian Gulf, putting, nearly 99% of the region’s proven reserves under the control of just six countries: Saudi Arabia, Iran, Iraq, Kuwait, U.A.E., and Qatar. Also shown in the map is each country’s average wealth*, measured as GDP per capita. Qatar, a small peninsula in the oil-rich Gulf, has a GDP per capita of $97,518, the highest in the world. Just 350 miles south of Qatar lies Yemen, whose GDP per capita of $1,408 is the lowest in the Middle East. 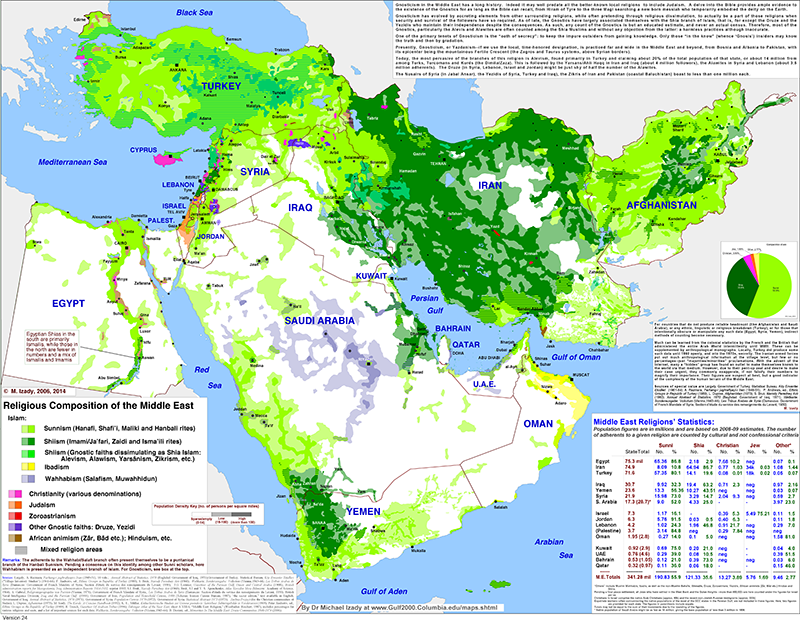 This map comes from Columbia University’s Dr. Michael Izady, who maintains the Gulf/2000 Project, an extensive collection of maps and statistics covering the Gulf region. A high resolution version of the map is available on the Gulf/2000 Project website. Previous Article There is Only 1 Shenzhen River, So Why Does Google Maps Show 2? What motivates foreign ISIS fighters? New research has an answer. The reason for the education “boom” with the arabs, was due to the Jews coming from Europe, to Jewish Palestine from 1880s to 1947. So give thanks to the jews for the the Arabs education increases. As soon as Israel stops ethnic cleansing Palestine. Assertions made without evidence can be dismissed. Primarily, the point of ethnic cleansing would be no more Palestinians and not an increase in population of said people so perhaps you should shift your focus to actual ethnic cleansing of all non-muslims in region. Nowhere in the Arab world do Arabs have the same civil rights and living standard as do the Arab-Israeli citizenry and is precisely why they support their government.